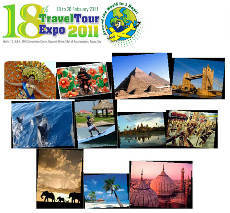 The country’s biggest event for travel and tourism industry will be held this weekend. With a theme of “Around the World in Three Days”, it is considered as the ultimate travel-shopping destination because more than 240 tourism-related companies will participate from Asia, Middle East, North America, South America, South Africa, and Europe. An estimate of 450 booths of participants from travel agencies, airline companies, cruise operators, domestic tour operators, government agencies, embassies, national tourism organizations, hotels and resorts, international tour operators, travel shops, and many more will also join. Expect lots of cultural presentations, souvenir items and discounted travel packages which can be up to 70% off! A total of 80, 000 people visited the event last year and sales generated was at least Php 200M.